Tens of thousands of Saudi students have gone abroad over the past several years with the support of the King Abdullah Scholarship Programme (KASP). The scale and ambition of the programme has been such that Saudi Arabia has become one of the most important sending markets – and certainly one of the fastest-growing – of the past decade. With just under 60,000 students enrolled, Saudi Arabia was, for the fifth year in a row, the fourth-largest sending market for the US in 2014/15 (after only China, India, and South Korea). Nearly 14,000 Saudi students went to Canada in 2014, making it the fifth-largest sending market there. Another 10,000 studied in the UK in 2013/14, leaving Saudi Arabia as the seventh-largest non-EU sending market for British providers that year. The KASP programme (also known as the Program of the Custodian of the Two Holy Mosques) began in 2005 with a five-year time limit. In 2007, King Abdullah extended the programme for another two years and in 2009 a further three-year term was granted. In 2012, the news came that KASP would be extended through 2020. KASP is administered by the Saudi Arabian Cultural Mission (SACM) under the auspices of the Ministry of Education (MOE). Most institutions or schools receiving KASP students will have had regular contact with SACM officials, and may have also been asked to address a variety of programme, service, and reporting requirements in relation to KASP-funded students. In our first interview segment below, Mr Ayman Abdelhafez of the Sindibad Education Consultancy (SEC) explains that requirements may vary by provider on a case-by-case basis and according to the needs of the students as well as SACM’s goal in ensuring the students’ success in their studies. As Mr Abdelhafez also notes, these goals may be reflected in very specific requirements from SACM regarding the number of hours of instruction per week and even class schedules. As you will also hear in the interview, Saudi Arabia’s new monarch, King Salman bin Abdulaziz Al Saud, and his officials are pursuing a number of ambitious projects in the Kingdom. The Ministry of Education has been actively engaged in discussions with other ministries, resulting in agreements to sponsor as many as 55,000 students within KASP in the years ahead. This exceeds the forecast of 40,000 students we noted in a recent report, but extends the approach we described at the time whereby KASP participation will focus on current public-sector employees as well as candidates who have a job offer from a governmental organisation, with the idea that scholarship recipients will have a secure job on their return to Saudi Arabia. One of the implications of this approach, Mr Abdelhafez says, is that KASP will be selecting more highly qualified students, both in terms of their academic standing but also their English proficiency. “I believe this works better for the country and for the KASP programme also,” he adds. This drive to study abroad is also creating a more discriminating Saudi student, one that is looking more closely at the quality and reputation of institutions abroad. In our second and final interview segment below, Mr Abdelhafez notes that the website of the Ministry of Higher Education is a key stop for Saudi students as they begin to map out options for study at language schools or universities abroad. 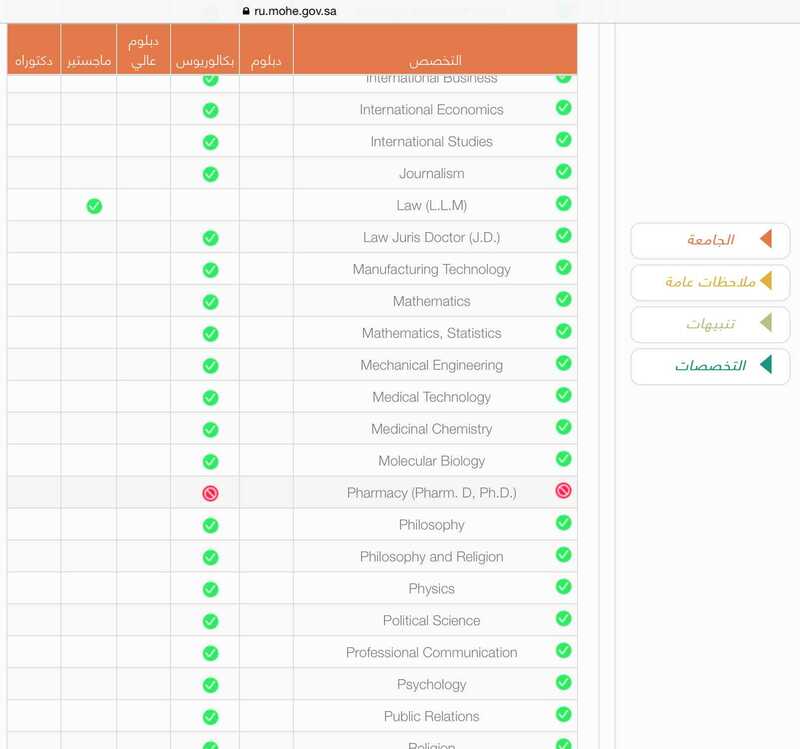 For example, the screen shot below shows a sample listing for a university on the ministry website illustrating the type of information provided for each institution or school, including the specific academic programmes at different levels which are open to KASP-funded students (that is, programmes to which students may be admitted and that are not yet “saturated” with other KASP students). Furthermore, Mr Abdelhafez discusses the importance of diversification for an agency’s portfolio, highlighting new partnerships in China, Hungary, Poland, Spain, Sweden, and Denmark. This entry was posted in Agents, Higher Education, Language Learning, Middle East, Regions, Saudi Arabia, Video Interviews and tagged tertiary education overseas, undergraduate student recruitment, scholarships for foreign students, international students, foreign languages.